As promised, here are some new items that had just been updated in the 'Bakery' menu. Check it out! A photo from cycling today. I am very lucky to live in the countryside. Nature is just so pretty! 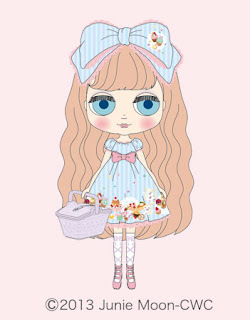 I have also just pre-ordered my first Blythe doll from Japan! I've been searching for the right kind of doll/girl to model my 1/6 miniatures and I thought Sadie Sprinkle is perfect since she loves cupcakes and decorating them! I'm going to stuff so many cute cupcakes into her lilac basket. The doll is only released in the end of May so I'm hoping she will arrive safely (the doll will be 'travelling' from Japan to England) before my birthday in June! She is also a little birthday present for myself. OK, time for supper. Bye! What an amazing little sweet shop! Your desserts are divine. Thanks Jackie. Your mini cakes are GORGEOUS! Your desserts are so sweet! I can't wait to see your new doll...she looks so beautiful! Thank you Pei Li. I can't wait for the doll either! It would be more than a month for now but I'm sure I can keep myself busy whilst waiting.